Not too long after publishing version 1 of the SmartFlare paper at Science Open, we received a couple of very helpful reviews. We’ve been working on the points made by the reviewers to improve the manuscript for version 2 (coming very shortly!). Below are some thoughts on a couple of the comments and a quick update on some new data in the works. Outreach is a really important part of Science Research, some would argue (and I would agree) that it is an obligation of Scientists to talk about what they do and inform and inspire the general public. When outreaching about Cell Biology and specifically, Microscopy, it’s great to be able to show people their own cells on a microscope. To figure out how best to do this in a quick, safe and cheap way, I had a play with some live-cell staining of buccal (cheek) epithelial cells. I previously tweeted about fabricating chambers for Fluorescent Correlation Spectroscopy (FCS). Given the response, I thought I would give a little more detail in a post. Update: we have submitted a Letter to PNAS as a response to the paper discussed below. It is currently available as a preprint. The Mirkin group recently published the latest paper to use Spherical Nucleic Acid (SNA) technology that we’ve come to know and love as Smart/Nano Flares. In an interesting twist, instead of having target oligos bind to the nanoparticle (displacing fluorescent reporter sequences), the reporter sequences are now complimentary to the target oligos, labelling them directly. In theory this allows for dynamic labelled, tracking and quantitation of mRNA in cells. As mentioned before, one of the things that has been bugging me about the SmartFlares is that they’re not where anyone expects them. EMD expect them in the cytosol (we don’t see them there), I expected them in endosomes and they weren’t really there either. So what could this mystery compartment be? Following on from the last post, the Uptake Control SmartFlares were loaded into cells, prepared and taken to the Electron Microscope. Throughout all of the fluorescent microscopy experiments, we’ve been seeing SmartFlare fluorescence in punctate structures. 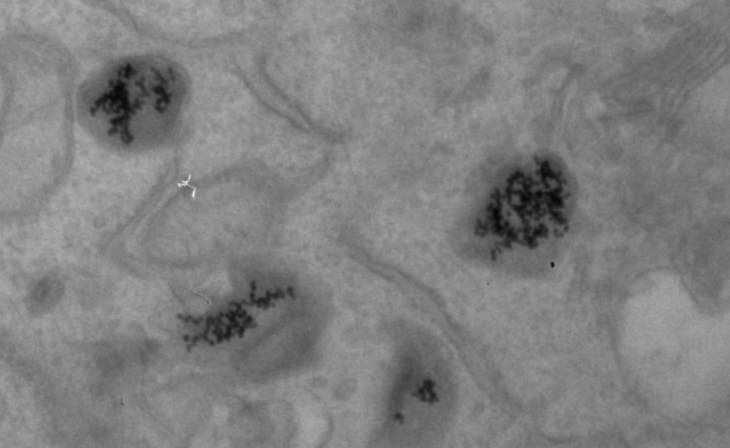 Using these techniques, it’s very difficult to say with certainty that the SmartFlares are within vesicles or (for example) aggregated/agglomerated in the cytosol. As this is pertinent to the current investigation, we took cells loaded with SmartFlares to the electron microscope which has the resolution to discern membrane structures as well as the gold particles.